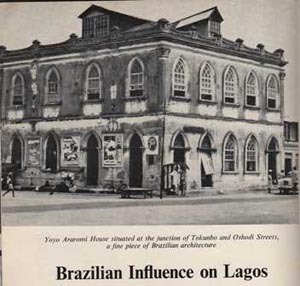 Yoyo Araromi House situated at the junction of Tokunbo and Oshodi Street, a fine piece of Brazilian architecture. 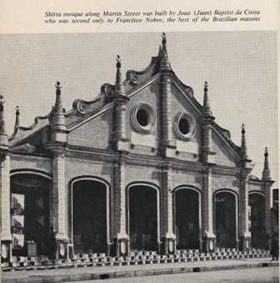 Shitta Mosque along Martin Street was built by Joao (Juan) Baptist da Costa who was second only to Francisco Nobre, the best of the Brazilian masons. 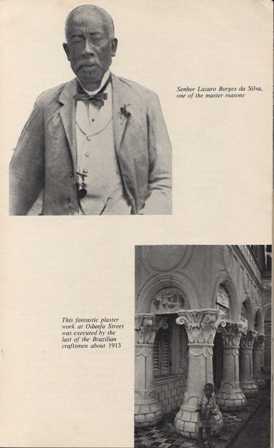 Bottom: This fantastic plaster work at Odunfa Street was executed by the last of the Brazilian craftsmen about 1913. In fact, the background to the British intervention in Lagos is the international rivalry that existed between the various European Powers to control the trade of important areas in West Africa…… Thus there was a strong commercial interest in Britain’s struggle against the slave trade. That is to say, the overseas slave trade, for the internal slave trade which was necessary for the development of legitimate trade was tolerated till the railways and wage labour made it unnecessary, J F Ade Ajayi wrote. The dispute in 1811 between Akitoye and Kosoko, long before Britain started trying to divide African rulers into those for and those against the slave trade, was also a factor in the British intervention and eventual annexation of Lagos by the British. I will endeavour to reproduce the whole article at a later date. I would like to dedicate this effort in reproduction to the late Chief Gani Fawehinmi (1938 – 2009), who, though not an Isale-Eko man, lived most, if not all his life in Lagos, and contributed immensely to the rich history and development of Lagos and Nigeria. May his soul rest in perfect Peace. Please, where can I found this article?? It was not research work and the situation when a licence is granted, an author can kep control over his work to a greater degree. A license has a right to see it exclusiverly in the way the licence states. The elders advised Akitoye to escape to his mother’s town in Abeokuta. When Kosoko had about the plan, he detailed his war chief, Oshodi, to lay ambush for Akitoye, kill him, and bring his head before him. Oshodi captured Akitoye in the Agboyi waters, but instead of killing him, he paid homage to him and his Lord and prayed for his safe journey and safe return. Chief Oshodi returned to report to Kosoko that Akitoye had escaped by the use of a powerful charm that put them all to sleep when he was passing. Historians were not able to assign any reason for the kindness and goodwill that Oshodi gave King Akitoye when in fact he was on orders to bring his head to Kosoko. In 1845, Kosoko defeated Akitoye and ascended the throne. In the meantime, Chief Oshodi remained his war chief. Akitoye, in exile, appealed to the British Government for help to restore him to his throne. 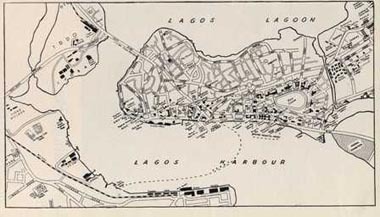 A war broke out; the British started to bombard Lagos, setting the town on fire. Kosoko defense under the command of Chief Oshodi was significant and modern by the international standard of the time. After nine days of consecutive serious military actions, the British fleet unleashed excessive gun power that resulted in the disposal of the Kosoko’s fleet. Under this unfavorable condition, Kosoko had to flee to Epe with Chief Oshodi and his warriors on the night of the13th of August 1853. 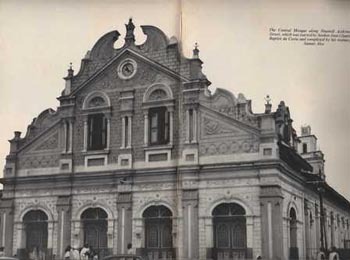 Akitoye was brought back to Lagos by the British and was restored as the King of Lagos. Akitoye died on the 2nd of September 1853, about two weeks after Kosoko and his men had fled. In the afternoon of September 3rd, 1853, his son, Dosunmu was formally installed as the King of Lagos. This was not the end of the issue, rather the beginning of the chapters of hope. There were sporadic raids on Lagos from Epe, disturbing the peace and trade of the island. With the understanding that things should not be made to rest as such, the British Consul Campbell, the Elders, and White Cap chiefs of Lagos, initiated a move to reconcile the warring royal relatives. On the 26th of January 1854, a peace conference code named Langbase peace meeting, was held at AGBEKIN (Palaver Island) about four months after King Dosunmu’s coronation. The British Consul’s party included the Commander of HMS Plato with other officers under his command, and Kosoko party’s which included Chief Oshodi Tapa and Chief Onisemo Adeburusi of Epe. They came without Kosoko in about sixty canoes each containing forty men. King Dosunmu delegates included by several White Cap chiefs and war Captains. At the opening of this remarkable conference, the Epe people, led by Chief Oshodi Tapa expressed their strong desire to the British Consul to return to Lagos and be at peace with their friends. Chief Oshodi proposed that Kosoko be allowed to return to Lagos to leave as a private person. The proposal was not agreeable to the Consul on the basis that two Kings could not rein in Lagos. Chief Oshodi however declined an offer to return to Lagos alone as the Consul for the people of Epe and insisted on Kosoko’s return to Lagos. Consequently Kosoko was allowed back to Lagos in 1862 with his war chief, after signing a peace treaty negotiated by Chief Oshodi with the British Consul. From the foregoing it is clear that Chief Oshodi was in a position after his return from Epe and his contributions to peace entitled to the grant of so large an area of land. On arrival to Lagos, Governor Glover sought permission from Aromire to give part of Epetedo to Chief Oshodi. For himself, his family, his followers, and servants who returned with him from Epe. This area was bestowed and held under the native customary law of land tenure subject to the native system of the devolution of land. Oshodi Place is located in the center of the area of land in Epetedo. The area is uniquely laid out into 21 compounds. Four of these compounds; Oshodi, Akinyemi, Ewumi, and Alegbede courts belong exclusively to Chief Balogun Oshodi’s extended family. A well researched historical piece which keeps our past in proper perspective so that our future can be born undeformed! Toks, This is fantastic…please Keep it up! Hope to access to materials if possible get one. Really want to know much about that. Thanks for the piece;The pictures support the assertions .